TRENDnet introduced the TPL-405E, a new 500Mbps Powerline AV adapter with four integrated Gigabit Ethernet ports. The MSRP of this product is $109.99. TRENDnet, a best-in-class wired and wireless networking hardware brand, today announces the availability of the 4-Port 500Mbps Powerline AV Adapter with four integrated Gigabit ports, model TPL-405E. New media center devices such as internet televisions, media players, network video recorders, receivers, and game consoles are now network ready-respective devices are capable of connecting to and streaming HD files directly from the Internet. 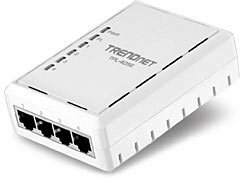 TRENDnet's 4-Port 500Mbps Powerline AV Adapter connects up to four media center devices to the Internet simultaneously using existing electrical lines. "Powerline solutions offer a stable high speed connection, to stream HD video, using the existing electrical lines in your home," stated Zak Wood, director of global marketing for TRENDnet. "With so many network ready devices around and including the TV, TRENDnet's TPL-405E helps solve the growing demand for multiple high performance network connections." The 4-Port 500Mbps Powerline AV Adapter, model TPL-405E, comes with a three year limited warranty and is currently shipping to TRENDnet's online and retail partners.